Christopher Lambert is an actor who played Connor MacLeod or 'The Highlander' in the film Highlander and its sequels. His other famous film credits include Greystoke: The Legend of Tarzan, Lord of the Apes and Mortal Kombat. He was married to Diane Lane from 1988 to 1994. The marriage produced a daughter named Eleanor Jasmine. He married his second wife Jaiymse Haft in 1999. The couple divorced a year later. From 2012 to 2014, he was married to Sophie Marceau. He appeared in British rock band Queen’s music video for the song “Princes of the Universe”. He suffers from a severe case of short-sightedness and is unable to see without his glasses. He often acts blind as a result of this. 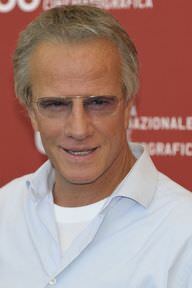 Christopher Lambert is a famous French actor, who was born on March 29, 1957. As a person born on this date, Christopher Lambert is listed in our database as the 6th most popular celebrity for the day (March 29) and the 28th most popular for the year (1957). People born on March 29 fall under the Zodiac sign of Aries, the Ram. Christopher Lambert is the 323rd most popular Aries. Aside from information specific to Christopher Lambert's birthday, Christopher Lambert is the 58th most famous French and ranks 6th in famous people born in Great Neck, New York, U.S. In general, Christopher Lambert ranks as the 3597th most popular famous person, and the 738th most popular actor of all time. “The Famous Birthdays” catalogs over 25,000 famous people, everyone from actors to singers to scientists to serial killers and more. If you're curious to see who was born on your birthday, you can use our database to find out who, what, where, when and why. You can search by birthday, birthplace, claim to fame or any other information by typing in the search box, or simply browse our site by selecting the month, the day, the horoscope, or any other clickable option. 6th born in Great Neck, New York, U.S.